I’ve read a few accounts by Holocaust survivors, most notably Primo Levi’s If This is a Man and Mark Baker’s The Fiftieth Gate, and I’ve read Thomas Keneally’s Schindler’s List – and seen the film too. But since most people did not survive Auschwitz, I hadn’t come across an account from someone who did, nor had I ever read anything by any of the Schindlerjuden. 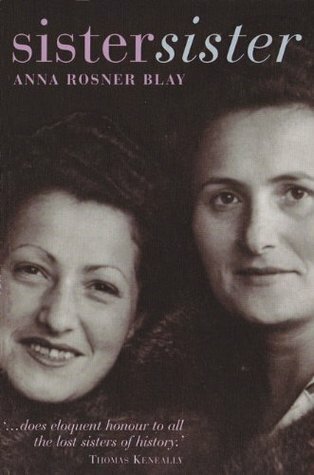 To look at the eloquent cover image of these two women looking unbowed by their experiences seems like a miracle after all they went through, but the cover also asserts something else that’s different: this is a Holocaust memoir not from the predominant male point-of-view. The memoir is told in the voices of three different women: Hela’s, Janka’s, and that of the author Anna who inserts her childhood memories into the narrative, especially the accounts of the post-war period in Melbourne. In this way there is a child’s perspective on a mother’s excessive anxiety about having enough food, about being warm enough, about being safe. Another image that strikes me from this memoir is of Hela at Schindler’s factory, learning from another woman how to turn a heel for a sock. They had been given some greasy wool, the men had fashioned some wooden knitting needles, and the women used it to knit garments to keep them warm in the harsh winter. Older women taught the younger ones as their mothers might have done had the girls not been separated from them when they were too young to learn. (Hela had lost her mother before the war, but many other young women were wrenched from their families when they were still children). The most notorious of the death marches took place in January 1945, when the Soviet army advanced on occupied Poland. Nine days before the Soviets arrived at the death camp at Auschwitz, the SS marched nearly 60,000 prisoners out of the camp toward Wodzisław Śląski (German: Loslau), 56 km (35 mi) away, where they were put on freight trains to other camps. Approximately 15,000 prisoners died on the way. I moved in with my sister, but I was afraid to stay in Kraków, not only because of the Poles and the Germans but because of the Russians too. I was afraid whenever I came across a group of Russians, remembering their brutality. My fear was so great that I wanted to leave Poland as soon as possible to get out of their reach. (Kindle Loc 3058). I was taken aback also by the way in which Hela and her sister were finally reunited after the war. Janka searched for Hela by asking around about Hela’s famous husband Poldek who was a musician. While eventually the system for reuniting displaced persons facilitated reunions or revealed the sad fate of loved ones, in some cases it took years. It’s disconcerting to think that in the early days, for some people, it was the man’s work that enabled finding a lost relation. For people who think they’ve read all they need to know about the Holocaust, this memoir offers fresh insights about the capricious nature of survival, and an inspirational view of the power of the human spirit. Sister, Sister was short-listed for the 1998 Age Book of the Year. For extracts from other reviews, visit Anna Blay’s author website. Transparency statement: I’ve never met Anna Blay, but I ‘know’ her through her comments on this blog, via Twitter and because as publisher at Hybrid Books, she sends me occasional books for review. That’s a very perceptive review, Lisa. You are right to focus on the difference between male and female accounts – they can be worlds apart. I think ‘the capricious nature of survival’ is a wonderfully well-chosen phrase in response to the horror of the Holocaust. I guess I might add a ‘transparency’ statement here too: I know Anna as a fine and compassionate editor for my husband Alan and generous with advice for me. Thank you, Ros:) Am I right in thinking that there are now more female accounts than there were, because of the Makor Write Your Story program? When did that begin? Thanks, Dennis, this book deserves to be widely read. Sarah Helm wrote an excellent book last year called If This Is A Woman which focused on the experience of women in Ravensbruck which was a concentration camp for women only. I’m on season two of A French Village–almost done with it, and the drums of doom are sounding for the jewish residents. BTW, the actor who plays Schwartz and the actress who plays Hortense Larcher both loom large in Spiral. On series 3 now. Yes it certainly does provoke discussion. I think the Dr’s servant had it right. The dr, as mayor, whittled the hostage-to-be-executed list down to ten, and Sara told him he shouldn’t have been a part of it in the first place. A slippery moral slope. And the posting in France does come across as a cushy job esp next to Russia. Yes, especially when with the benefit of hindsight we know what a posting on the Russian front meant!